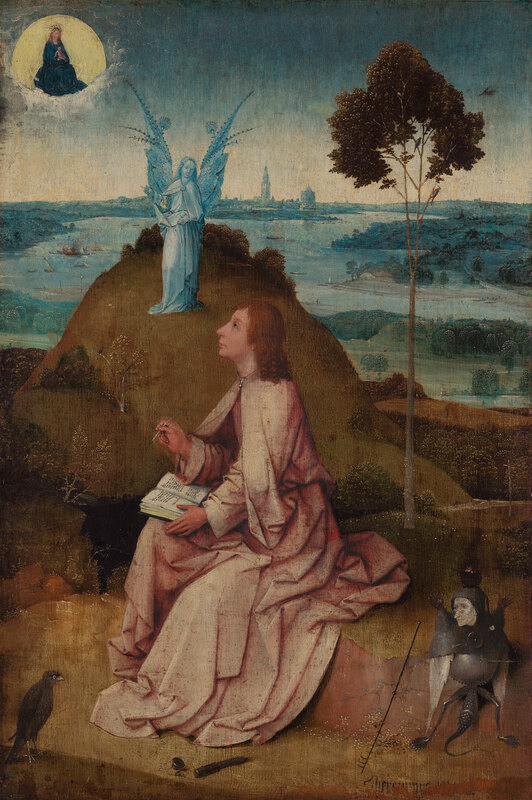 Hieronymus Bosch, St. John on Patmos, c. 1500. ©Staatliche Museen zu Berlin, Gemäldegalerie. To mark the 500th anniversary of the death of Hieronymus Bosch, the Gemäldegalerie and the Kupferstichkabinett will stage a studio exhibition displaying their holdings of Bosch’s own work, as well as copies made from it and artworks inspired by it. The centrepiece of the exhibition is the oak panel painting St. John on Patmos, one of Bosch’s major works, signed by the artist. Facing this will be four copies based on Bosch’s greatest paintings, including the monumental Last Judgement, by no less a figure than Lucas Cranach the Elder, a copy based on Bosch’s original, now hanging in the Academy of Fine Arts in Vienna. The freshly-restored Temptation of St. Anthony, made as a smaller version of Bosch’s famous triptych, now in Lisbon, will be shown for the first time in 150 years. The fact that the fantastical worlds of Hieronymus Bosch – as the painter signed his work – continued to be a source of inspiration for Netherlandish artists even in the 17th century is demonstrated by works by Adriaen Brouwer, David Teniers the Younger, and Frans Francken the Younger. The Kupferstichkabinett holds over half of Bosch’s surviving drawings, regarded as the high point and culmination of 15th century Netherlandish drawing. Among them, The Wood Has Ears, The Field Has Eyes stands out as one of his three so-called master-drawings. Bosch’s intimate drawings reveal him to be a virtuoso of the medium, capable of intuitively realizing his figures and visions in just a few swiftly-sketched strokes. For the first time in fifteen years, all of Bosch’s drawings held in Berlin will be displayed, with both recto and verso shown. For conservation reasons, these highly sensitive works will be shown in pairs, with the selection changing every few weeks. Bosch’s originals will be supplemented with drawings and prints by his immediate circle, as well as by his successors and those he influenced, ranging from Alart du Hameel to Pieter Bruegel to James Ensor.